Seven priority themes emerged when analysing the data collected during the consultation phase. The seven themes combined provide the foundation for what residents told us makes a happy, healthy community. The following pages provide information about what the community told us about each priority theme and their supporting strategic objectives and strategies. Each theme has a strategic objective that describes the outcomes we are seeking to achieve. The strategies describe the areas we will focus on to achieve the strategic objectives, and will be implemented through actions in our policies, plans, strategies, projects and budget over the next 10 years. Each strategic objective will be measured by a set of strategic indicators to monitor our progress. 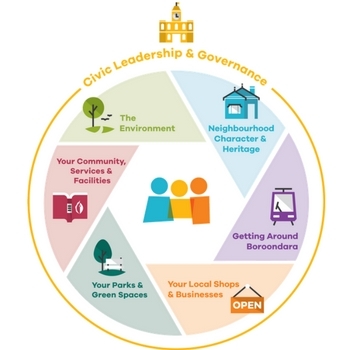 To learn more about our strategies, download the full Boroondara Community Plan 2017-27 - designed PDF, Boroondara Community Plan 2017-27 - text format or Boroondara Community Plan 2017-27 - PDF of text version.